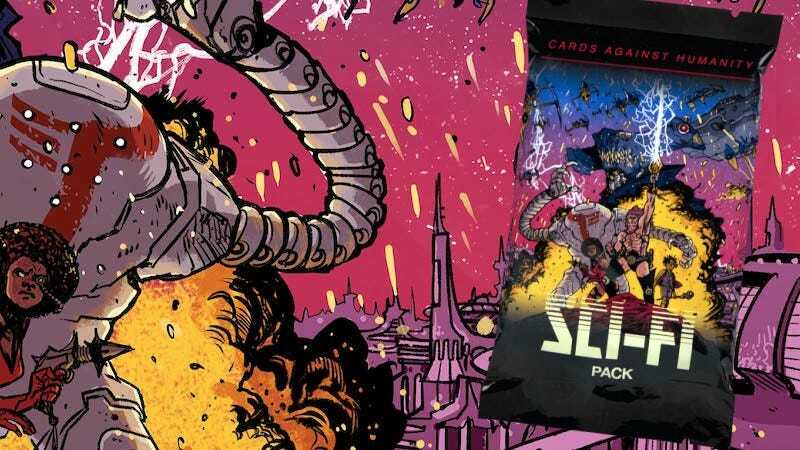 Self-proclaimed “party game for horrible people” Cards Against Humanity has teamed up with a group of science fiction authors to produce a special themed pack of cards. Patrick Rothfuss (The Kingkiller Chronicle) announced the pack on his website, reminding everyone that he participated in making Cards Against Humanity’s fantasy-themed pack with 11 other writers. This new one is a science fiction-themed pack, created with contributions from Rothfuss, Delilah S. Dawson, Elizabeth Bear, Jim C. Hines, Myke Cole, Martha Wells, Catherynne M. Valente, and others. The 30-card pack went on sale for $5 at the Cards Against Humanity store on December 5. For the first two weeks, the sale proceeds will be doubled and passed on to Rothfuss’ charity, Worldbuilders, in support of Heifer International.